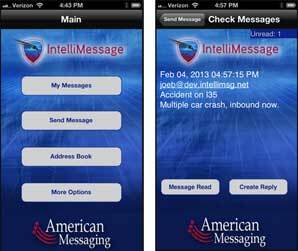 IntelliMessage® is an emergency messaging app that Info-Power created for American Messaging, LLC. It is intended for use in diverse environments, such as schools and hospitals. This system of applications will deliver emergency messages to every device in which a responder is logged in. Then, the system manages the response from whichever device the user can get to first. The app is available on the iPhone, iPad, iPod Touch, Android, Mac, and PC. PUSH notification services (APNS and GCM) notify the user when they have a message. JSON, REST Services, and MSSQL are implemented to complete the chain of communication using SSL for security and data exchange. As you can imagine with any emergency situation, reliability and up-time are critical requirements. The IntelliMessage® system of apps deliver on both.